The Air Force’s long-range strike bomber has officially been named the B-21 Raider. Air Force Secretary Deborah Lee James announced the results of the Air Force Global Strike Command led naming contest alongside selected members during her remarks at the Air Force Association’s Air, Space and Cyber Conference in National Harbor, Md., Sept. 19, 2016. The third Airmen James recognized, calling him one of the greatest men of his generation, was Doolittle Raider retired Lt. Col. Richard E. Cole. The Doolittle Raiders are known for their surprise attack against Japan during World War II on April 18, 1942, which forced the Japanese to recall combat forces for home defense, and boosted morale among Americans and U.S. allies abroad. 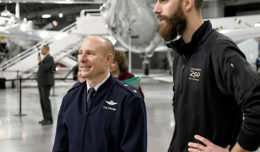 The name was ultimately selected by James and Air Force Chief of Staff Gen. Dave Goldfein after a panel composed of staff from AFGSC and Headquarters Air Force determined the top-ranked selections from more than 2,100 unique naming submissions. 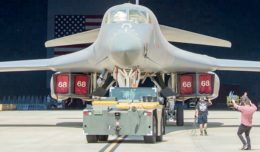 While there were multiple entries advocating for the B-21 to be dubbed Raider, Air Force officials said the members were selected based on the overall quality of their justification. James has often highlighted the important role the B-21 Raider will play in allowing the Air Force to operate in tomorrow’s high end threat environment, and in providing the Air Force the flexibility and capability to launch from the continental United States and deliver air strikes on any location in the world. She has also cautioned of the delays the program could face under a continuing resolution. The service’s ability to divest old capabilities and build new is paramount, and modernization remains a priority for the Air Force as it continues to play a major role defending against current and emerging threats. 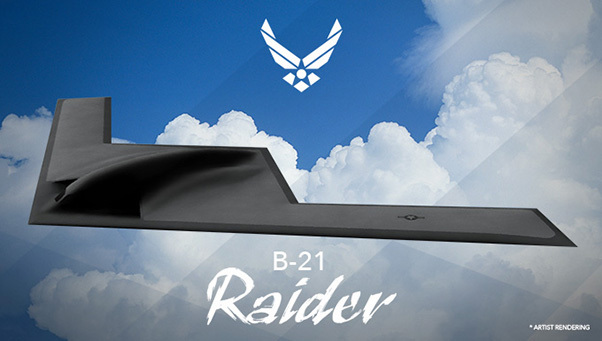 The B-21 Raider, designed based on a set of requirements that allow the use of existing and mature technology, is currently in the Engineering and Manufacturing Development phase and the Air Force plans to field the initial capability of the aircraft in mid-2020s.